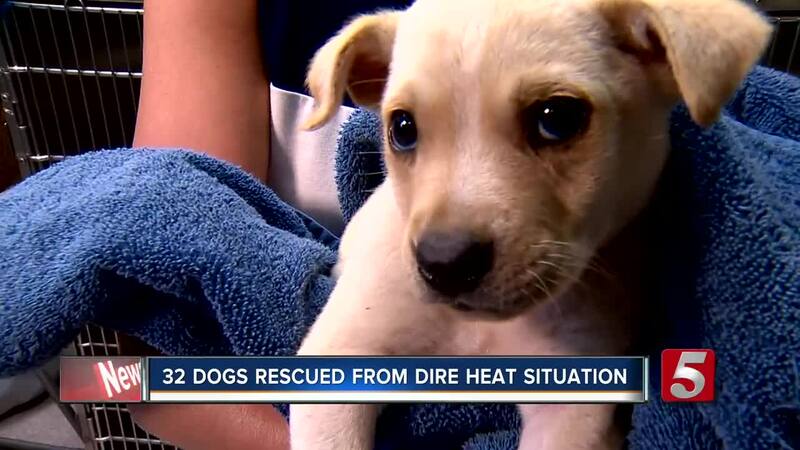 A local non-profit rescued dozens of dogs from a dire heat situation in East Tennessee. Campbell County's animal control lost their air conditioning units on Friday, so they reached out for help. The Nashville Humane Association immediately responded with an air conditioned transport van to take some of the animals to Nashville. A litter of puppies was found in a dumpster in Campbell County, and not long after they were brought to animal control, the air went out. According to the executive director, it reached temperatures between 85 and 95 degrees. "They're susceptible to disease and injury and illness, so we wanted to pull them out and have them in air conditioning," Laura Chavarria said. They also rescued some of the dogs that were in need of specialized medical care. "We have Carly who had an old pelvic injury. When she showed us she had kind of gnawed some of her toes off, so we brought her in." Chavarria said. After getting some acupuncture, Carly started to heal. "She's starting to get a little feeling up in here," Dr. Anderson said. Two pit bulls were also rescued Friday. "They were in the back. They were actually in indoor/outdoor cages, which were even hotter," Chavarria said. "I'd say they were about 95 or 100 degrees." Nellie and Nolan were the first from the group to get better. "We believe that they could have been used as bait dogs or a pit bull fighting ring. They have some scars on their faces. We don't know what their history is, but they need a little bit of nursing back to health," Chavarria said. On Sunday, Nellie and Nolan were moved to the adoption floor. Now, they're one step closer to finding a new owner to love them. They're still nursing the other dogs back to health. Once they're better, they'll be ready for adoption. Donations of gently used towels, paper towels, and toys are NHA's greatest need. They are also thankful for the monetary donations that make these types of rescues possible.